Yes, thats right, ONE VISIT CROWNS. No more impressions. No more temporary crowns for weeks. No second appointment away from your job or family responsibilities weeks later to get your permanent crown. So how is this possible? We have acquired technology called a CEREC OMNICAM. This latest generation of CAD/CAM (Computer Aided Design/Computer Aided Manufacturing) dentistry allows us to use 3D color video scanning of your teeth so that we can design your crown (and other restorations) with this amazing software. We then custom mill your new crown out of the latest high strength and esthetic porcelain materials now available in dentistry. 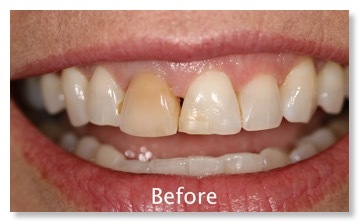 And once milled, we permanently cement your new crown before you leave our office. Is every crown situation possible with this new technology? In a word, NO, but those cases are very rare and generally involve a severely compromised tooth that may actually need treatment different from a crown. How long has this technology been around? The latest imaging in 3D full color was released in August, 2012, but the original development was done at Zurich University and has been in use in dental practices world wide since 1985. So how good are these materials? Outstanding! There are several international manufacturers that are continually researching and completing long term clinical studies that provide the various materials that we as CEREC Dentists have available for use. Do they look natural? Amazingly so! As mentioned above, there are many choices available in a wide range of color, type and size to suit each patient and individual tooth. And in addition to those choices, we can custom stain and glaze many of these materials to add unique characterization that will meet your particular need. What about crowns on implants? Absolutely. We have many years of experience restoring implants and this amazing technology allows us to use several techniques that result in very strong and esthetic implant crowns. So if I need a crown, what do I do? Simply call our office at (601) 629-4100 and let us know if you have a dental emergency or desire a comprehensive dental evaluation as discussed on our ABOUT US page and click on NEW PATIENTS. Our staff will discuss your dental needs and schedule your appointment accordingly.